Irish stamps, which show the word 'Éire', but not 'Ireland'. 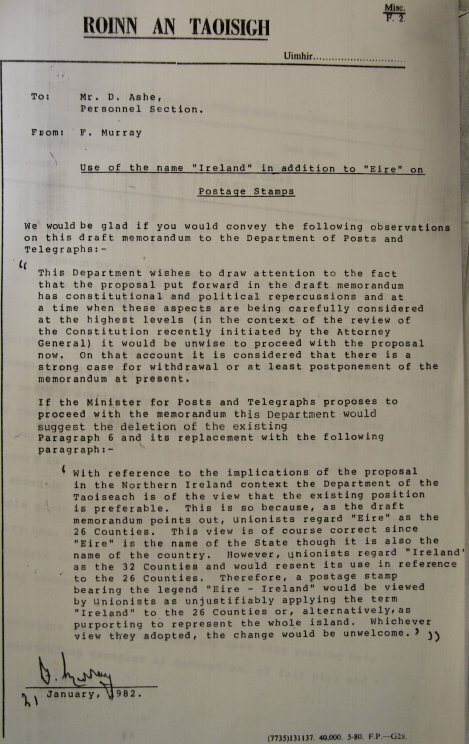 DOCUMENTS RELEASED UNDER the ’30 year rule’ show the level to which Northern Ireland impacted on decisions which, on the face of it, would appear minor. This was evidenced by correspondence between the Department of the Taoiseach and the now defunct Department of Posts and Telegraphs. In a communique titled “Use of the name ‘Ireland’ in addition to ‘Eire’ on Postage Stamps”, Frank Murray, from the Department of the Taoiseach, wished to stress the “constitutional and political repercussions” of this. With reference to the implications of the proposal in the Northern Ireland context the Department of the Taoiseach is of the view that the existing position is preferable. This is so because, as the draft memorandum points out, unionists regard ’Eire’ as the 26 counties. This view is of course correct since ‘Eire’ is the name of the State though it is also the name of the country. However, unionists regard ‘Ireland’ as the 32 counties and would resent its use in reference to the 26 counties. Therefore, a postage stamp bearing the legend ‘Eire – Ireland’ would be viewed by unionists as unjustifiably applying the term ‘Ireland’ to the 26 counties or, alternatively, as purporting to represent the whole island. Whichever view they adopted, the change could be unwelcome.